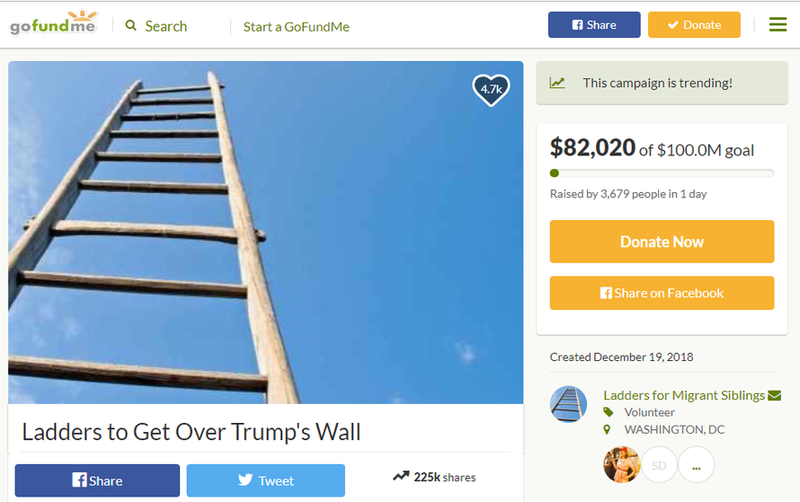 A GoFundMe campaign to publicly fund President Trump's southern border wall has some competition; ladders. While the GoFundMe for the wall has reached over $12 million as of this writing, a campaign set up by the group Ladders for Migrant Siblings has raised more than $82,000 of its $100 million goal. "we wanna make sure ladders are ready to send over to our undocumented friends and help them," reads the GoFundMe page. The organizers say that if they are unable to reach their goal, or the wall campaign is unable to reach theirs, all funds raised will go to the Refugee and Immigrant Center for Education and Legal Services (RAICES), a Texas 501(c)(3) nonprofit that provides free and low-cost legal services to immigrants. "they’ll never reach their goal, but no matter how much we raise, we’re going to reach ours," the ladder campaign page reads. "Supporting an organization working to help immigrants seeking legal asylum. This GoFundMe isn’t really about ladders at all. It’s about lifting people up."